It is closed for all Canadian statutory holidays and for designated Japanese holidays. Please see below for the list of holiday closures. Anyone wishing to visit the Embassy should make an appointment. Due to construction, there is no public parking at the Embassy. We thank you in advance for your cooperation and apologize for any inconveniences this may cause. The Embassy is located on Sussex Drive between the United States' Embassy and the Pearson Building which houses Foreign Affairs Canada. There are several landmarks close to the Embassy, including the National Gallery of Canada and the Royal Canadian Mint. 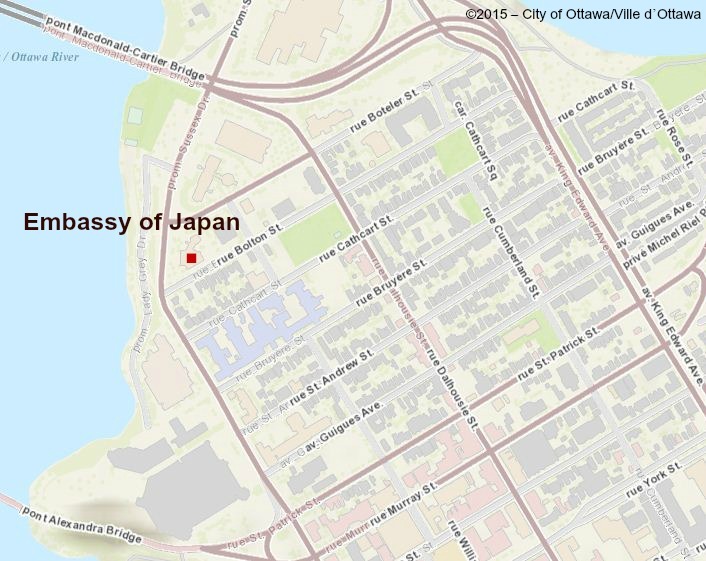 The Embassy building overlooks the Ottawa River. The consular office is closed for all Canadian statutory holidays and for designated Japanese holidays. Outside of regular office hours an automated voice attendant will guide any calls. Emergencies are handled on a 24-hour basis. The Information and Culture Centre is closed for all Canadian statutory holidays and for designated Japanese holidays. The Information and Culture Centre may be closed to the public on those days when special events are held at the Embassy. If you wish to use the Centre's facitlities please contact the Information and Culture Section beforehand to ensure availability.